10 Great Abdominal Exercise Ball Movements! 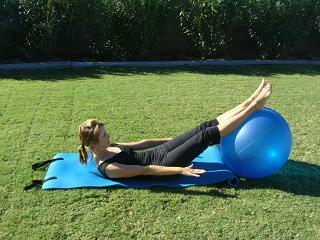 The abdominal exercise ball is a fantastic way to challenge your core strength and balance. Also known as an abdominal exercise swiss ball, the instability of the ball keeps your whole body (mainly the "core") working through each exercise movement. Try these 10 ab exercise ball moves to rev up your existing workout and develop a stronger core and leaner muscles. 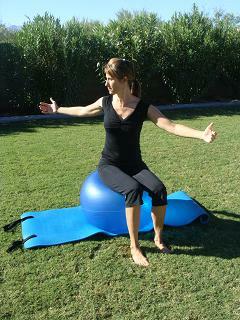 This great abdominal exercise can be done by walking out on the ball as shown above. The further you walk out the more difficult it is to keep the solid plank position. Hold this position for 3 breath cycles in and out. Walk back to rest, then repeat 3-6 times. Sit sideways on your abdominal exercise ball with your hips and ribs resting on it and your feet up against a wall or stable surface. Place your hands at the back of your head with your elbows wide, do this by drawing your shoulder blades down and towards your spine. Inhale as you lift the ribs off the ball extending your upper body up while pressing your hips deeper into the ball. Feel a lengthening up through the top of your head. Then Exhale as you lower the upper body back down and repeat for 4-8 repetitions on both sides. Get started today with these and more abdominal exercise ball moves in the new Pilates Core Ball Challenge DVD! Lie with your stomach on top of the exercise ball then walk out to a plank position with your thighs supported on the ball and your feet floating in the air. Bend your arms lowering your chest between your hands then press up with an exhale. Imagine you as a teeter totter. Do as many as you can with good form for 10-15 repetitions. The ball should remain fairly still. Begin lying on your back with your heels and calves resting on top of the ball. Exhale as you curl your head and shoulders off the mat reaching your fingertips down to the end of the mat with arms long and lifted. Press your feet gently into the ball as you begin inhaling for 5 counts and then exhaling for 5 counts as you pulse your arms up and down with the beat. Repeat for 10 repetitions keeping the ball and your torso still. Lie on the floor with both feet on top of the abdominal exercise ball. Exhale as you lift your back and hips off the floor pressing your feet evenly into the ball to stabilize your torso. Feel the weight in your shoulders and feet to stabilize you. Then exhale as you peel or roll your spine back down the mat until you are back to starting position. Repeat this exercise for 6-8 repetitions. See a regular Pilates Bridge on the mat here. With your stomach on the ball, abs tight, and hands on the floor walk out to a plank position until your thighs or knees are on the ball (the farther out you walk the harder it will be). Exhale as you draw your abdominals up and in pulling the ball with your knees towards your chest, tailbone goes up to the ceiling. Inhale to extend the legs back out to the starting plank position. Repeat for 4-6 repetitions. Sitting tall on your mat with your abdominal exercise ball between your legs. Inhale as you turn at the waist and then exhale you roll your spine down reaching your hand down the outside of the leg like you are going to saw off your pinky toe. Inhale as you reach through the back arm to roll the spine back up to start. Repeat for 4-6 repetitions to each side. Keep your buttocks anchored to the mat as you rotate from the ribcage and waist. See the Pilates Saw performed for you on the mat here. Sitting tall on the ball with the arms extended out to the side turn at the waist inhaling with a little pulse then exhale coming back to the center. Repeat to each side 5 times with a pulse getting taller as you turn. See this one on my Pregnant ball exercise page. Lie on your back on a mat with your legs extended and the abdominal exercise ball in your hands overhead. Inhale as you reach the ball up and then towards your feet curling your head and shoulders off the floor, then exhale to peel the spine all the way off the mat reaching the ball out to the feet. Inhale as you sit back up then exhale to roll the spine back down to a lying position. Repeat 4-6 times. Great exercise for the sides of the waist. Lie on your back with knees bent and feet up in the air. Hold the ball in your hands. With your head and shoulders lifted pull one knee to your chest and extend the other leg away from you. Reach the ball to the outside of the bent knee then switch for 10 counts.